This cycling trip originated with a family vacation on the Olympic Peninsula in Washington state. Since we were already “in the area” we decided we would bring our bikes and piggy back on that trip with a cycling tour in British Columbia. We would take the Yellowhead Highway through the Canadian wilderness. The tour quickly became a multi-modal transportation puzzle. Fitting together ferry and train schedules was tricky business. Cycling soon became only a fraction of the overall mileage, yet posed its own logistical challenges. We ultimately scuttled our plan to start in Jasper due to 150 miles with no services. Prince George became our new starting point. As compensation, we threw in a visit to Haida Gwaii, formerly known as Queen Charlotte Islands. Situated 90 miles off the coast, it has a vibrant First Nation culture and a raw beauty. The resulting tour promises constant scenery. We will start at the northern tip of Vancouver Island, with an 18-hour ferry trip to Prince Rupert (just 15 miles short of Alaska). From there we board Canada’s Via Rail for a full day journey to Prince George. There we finally begin cycling the Yellowhead Highway, back to Prince Rupert. Another full day ferry ride will deliver us to Haida Gwaii where we will travel to the western terminus of the Yellowhead Highway at the northern end of Graham Island. 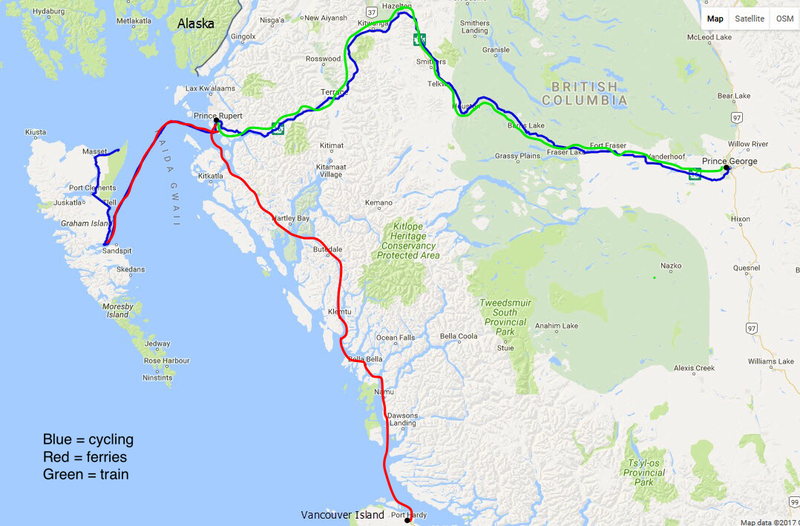 For the finale, we retrace our route back to Prince Rupert. In all, it encompasses 620 miles of cycling, 575 miles by ferry, and 450 miles on the train. Since we will be traveling in peak season, we have firm reservation for each night’s lodging as well as the train and ferries. It’s a big change from our normal plan-as-we-go approach, but with the scarcity of lodgings on our route we deemed it a wise move. As usual, Rich and I will both be blogging along the way. I will keep this page updated with each new post. We hope you follow our travels! Hospitality and friendship with Warm Showers – May we spend the night? Molly’s blog posts – All blog posts related to the Yellowhead Cycling Tour, including those leading up to the trip and after thoughts. Rich’s view of the trip – He posts to the Crazy Guy on a Bike website, which is a widely used portal for long distance cycling trips. Scroll down to page to Table of Contents to find the individual posts.